While preparing for Bathroom Blogfest 2010, Bethany Richmond from the Carpet and Rug Institute Blog came across Stalls and Walls. Her note said "rather amusing, sometimes obscene" [which in its succinctness reminded me of my all-time favorite line "good tea, nice house"]. 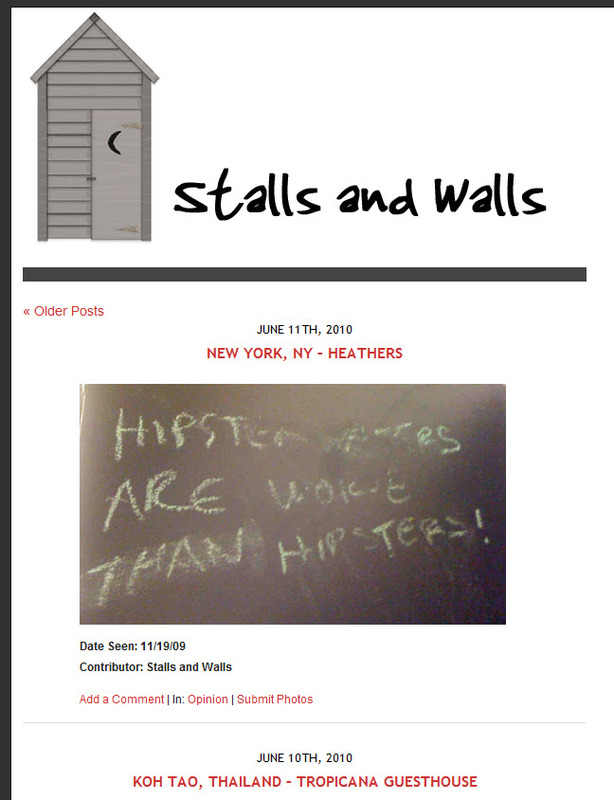 Stalls and Walls describes itself as "A collection of jokes, philosophy, poetry, political commentary and art found in the bathrooms of the world." Some establishments keep a vigilant eye on their bathrooms and quickly paint over any blemish encountered. Yet, other establishments let their customers make and leave their mark, creating a running history for all those who visit the restroom. 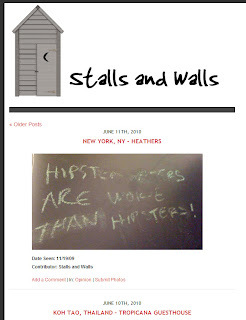 In either circumstance the messages are perishable, which is why I felt Stalls and Walls would be the perfect place to share and make a record of those deserving notice...."
Unfortunately, I don't notice much activity since June 2010. Nonetheless, there's still plenty there to... appreciate!